Divorce between Maria Shriver and Arnold Schwarzenegger ends for $ 375 millions ! The divorce settlement between former California governor Arnold Schwarzenegger and wife Maria Shriver consists in dividing the whole family fortune in two equal shares. And as the family fortune is valued around $ 750 millions, both Maria and Arnold will get an equal share of $ 375 millions. But a guilty Arnold is determined to give her ex wife more. Radar Online reports that Arnold agreed to give his wife a “very generous divorce settlement” after the official separation. The California law states that if there is no prenuptial contract signed, each partner of the couple gets 50% of the assets of the family. But in this case, things are different. 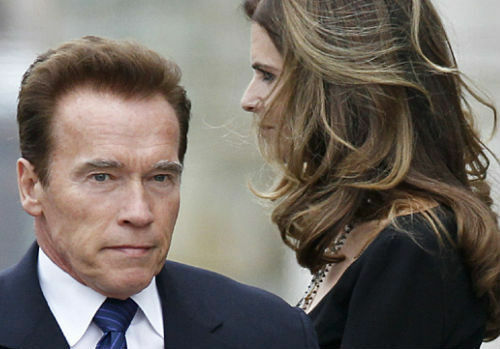 Recent reports state that Arnold is willing to give more than 50% to Maria Shriver. Maria Shriver filed for divorce on July 1, although the former couple has been trying to reach a settlement for two months now, through their attorneys. Shriver has hired investigators to find out exactly how much money does Arnold have. The approximations of the fortune lead to a huge sum between 500 and 750 million dollars, according to the same Radar Online source. “This is going to be very amicable and it won’t be played ut in the media” as neither of them wants publicity. Arnold gesture of giving Maria his fortune is proof that he takes responsibility for his actions and he meant the proof especially for his children. Maria Shriver and Arnold Schwarzenegger split earlier this year, after she was confirmed that her husband fathered a son with one of the member of the housekeeping staff, Mildred Baena.